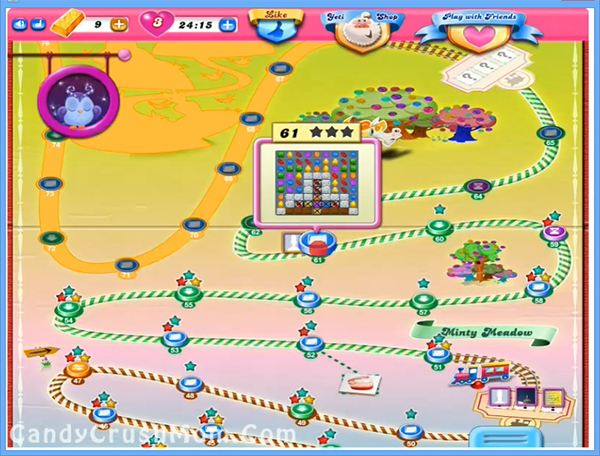 This level have 69 candy board with lot of blockers like 6 chocolate, 17 meringue blocks and 9 grill boxes. To complete this level first try to break grill boxes, then meringue blocks and then all chocolates so they wont increase later. To reach requirement within moves you might need to make special candies like colorbomb that you can get by combining five same color candies and try to combine colorbomb with other special candies like striped candy to break all jellies within few moves. After you could get fish booster or striped candy to get more points on score board. We completed this level with 100400 score and got three colorbomb that help us to make three star score on board.